The Mary Poppins Returns actress looked stunning in a black dress with semi-sheer sleeves while The Office alum donned a red jacket, black shirt and black pants. The dynamic duo were all smiles as they posed for pictures on the red carpet. They also weren’t afraid to show some PDA. The two wrapped their arms around each other as the cameras flashed, and Blunt tenderly held onto her hubby’s jacket. She was also staring up at her spouse while they were being photographed. It’s no secret these two are the definition of #RelationshipGoals. To see more of their cutest couples photos, check out the gallery. Where do all great romances begin? The gun range, of course! “On our first date, I decided I’m gonna really hit the gas and bring her to a gun range,” John explained on Conan. “I think that I was so sure that I would never end up with her…that I was like, ‘You know what, I’m gonna blow it right away and then that way you don’t feel bad. '” He couldn’t have been more wrong! “I think she’s hilarious, extremely talented, and I’m definitely her number-one fan,” John told People Magazine about his actress wife. In fact he told E! News that he’s watched one of her films, The Devil Wears Prada “like, 75” times. John knows that its more than his good looks that Emily loves. “The truth is, she really is that person who would like me any way, but I don’t think she’s going to kick the eight-pack abs out of bed,” John quipped to ELLE. What gives the couple the most joy is being parents to their two daughters—Hazel and Violet. “My children’s happiness, their safety and their well-being is the most paramount thing in my life,” Emily told People. John isn’t afraid to gush about his wife’s acting skills. “She is without a doubt the classiest, smartest, most dedicated actress I’ve ever know,” he revealed on Jimmy Kimmel Live after working with her on their hit film, A Quiet Place. John and Emily are happier than ever. “It’s really that we just got lucky. It’s one of those things, I’m having more fun now than the day I met her, and it’s pretty wild,” John told People. The two turned heads at the 24th annual Critics’ Choice Awards. It certainly has been a busy time for the couple. 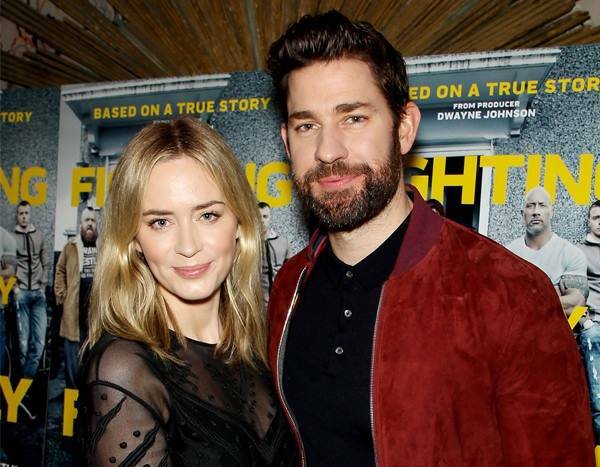 They both starred in the 2018 film A Quiet Place, for which Blunt received a SAG Award and Krasinski directed. Blunt also received a Golden Globe nomination for her portrayal of the magical nanny in Mary Poppins Returns and is currently working on Disney’s Jungle Cruise. Krasinski also stars in the Amazon series Tom Clancy’s Jack Ryan. Richard E. Grant: How Much Is the Oscar-Nominated 'Can You Ever Forgive Me?' Star Worth?